This is good usually for users who require Adobe Flash. The main reason why that is the case is that users don’t have to worry about the installed version of Adobe Flash too much, as Google takes care of the updating. While this works fine most of the time, usually before or at the time Adobe releases updates for Flash, it may happen that Google is late to the party when it comes to pushing the updated version of Flash to Chrome installations. This has the effect that Chrome users run an outdated version of Flash, and that should be cause for concern as that goes along with a truckload of vulnerabilities usually. Downloading and installing the latest Flash Player from Adobe won’t help in this case, as Chrome relies on the PPAPI version of Flash and ignores the NPAPI version that is installed from Adobe’s site. 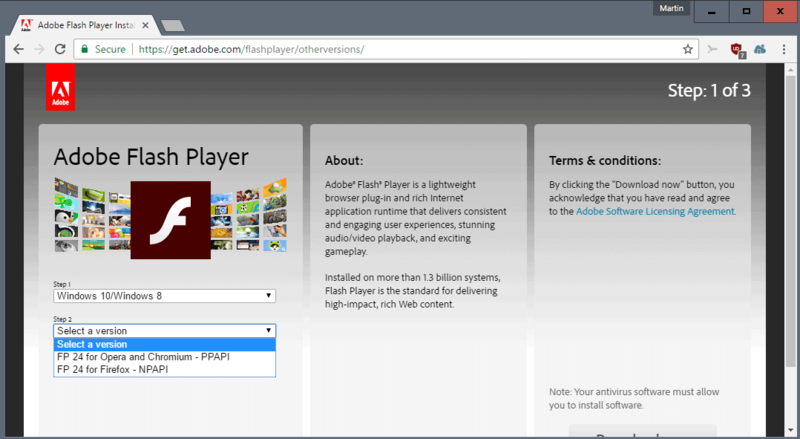 Adobe offers Flash PPAPI versions for download, and that is one option that you have to update Flash in Chrome and Chromium. But, there is another option, one that is more comfortable than having to visit Adobe’s website, downloading the new Flash installer from it, and running it on devices that you want to update. We talked about Chrome’s chrome://components/ page back in 2012 for the first time, and hinted at the possibility of using it to check for updates. 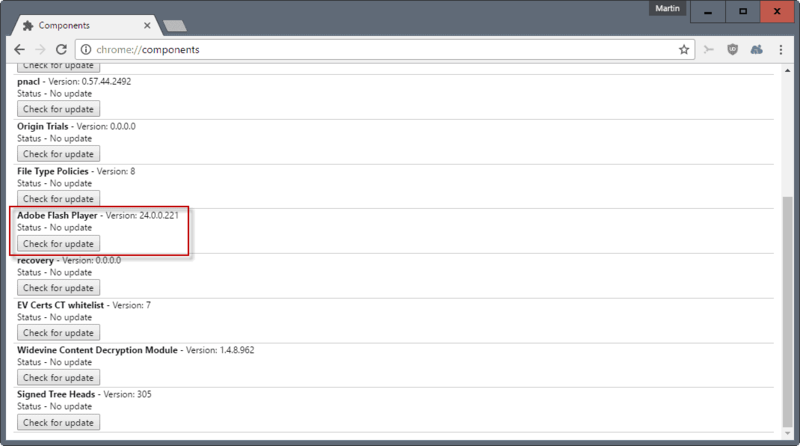 Load the internal chrome://components/ page by pasting it in the address bar and hitting the Enter-key (or typing it). Locate Adobe Flash Player on the page. You can check the version right then and there, or hit the “check for update” button underneath it right away. This runs an update check. If Google has released an update, but not yet delivered it to your device, it will be downloaded and installed. Tip: you may disable Flash in Chrome entirely as well if you don’t need it. This entry was posted on Thursday, February 23rd, 2017 at 11:31 am	and is filed under security, tech tips. You can follow any responses to this entry through the RSS 2.0 feed. Both comments and pings are currently closed.